Watch a concert Help victims of Ondoy! 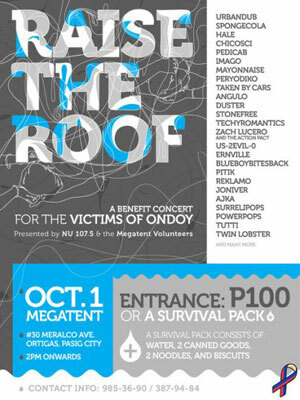 Raise the Roof!, a benefit concert for the victims of typhoon Ondoy happens on Thursday, 1 October 2009 from 2pm-12mn at Megatent, #30 Meralco Ave., Ortigas, Pasig City (beside Renaissance Towers). For just P100 pesos, you get to see the following bands: Urbandub, Imago, Peryodiko, Chicosci, Spongecola, Mayonnaise, Taken by Cars, Zach Lucero and the Action Pact, Typecast, Boy Elroy, Bagetsafonik, Chillitees, Julianne, and more. A survival pack that consists of water, 2 canned goods, 2 packs of noodles, and biscuits will get you in, too. This is presented by NU 107, Myx, and the Megatent Volunteers. Please call 985-3690 or 3879484, or email kmarvilla@gmail.com for details. If you're nearer the Mandaluyong area, the league of band managers has also put up a show at the Mandaluyong Gym on the same date, October 1. Slated to perform are Sugarfree, Itchyworms, Ciudad, Hilera, Silent Sanctuary, Spongecola, Mayonnaise, and many others. Donations stand as entrance fee. By attending these concerts, you'll be helping out in two ways: You get to help the victims with your donations/ entrance fee and you get to help the artists help the victims. Now, if that's not nice, we don't know what is.